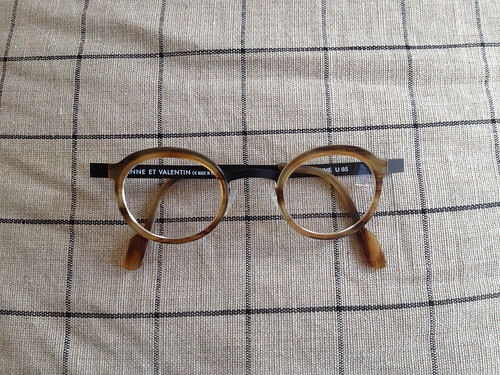 I've been wanting a pair of Anne et Valentin frames since I was fourteen. I remember peering into the window display at a frames shop in Northampton and staring wishfully at them. At some point in late high school I managed to get a pair of LA Eyeworks frames (I don't know how I pulled that off, lots of begging? ), but I lost them at a friends house 2 weeks after I got them(!) and they were never found. (So when you are young you just shouldn't have nice things, bad things happen to them). 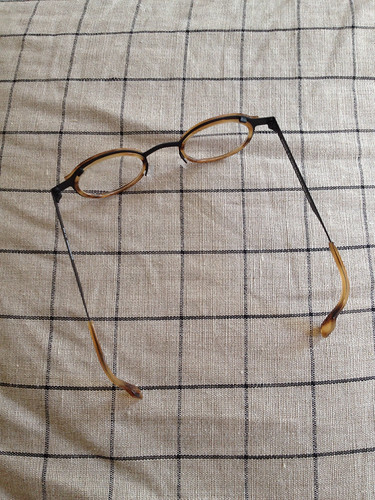 Feeling guilty for the next decade, spending lots of money on glasses seemed like a silly thing to do. So rather than save up for a bit, I went through a few pairs from Lenscrafters, See, and one from Warby Parker, but the lens quality wasn't that great and little parts on them kept breaking or scratching easily. At some point in the last year I decided it was time and a bit the bullet about a month ago after saving up. And it was worth it! More than anything I notice the lens quality difference, I don't think I've ever seen things so crisply. The style is called fanzine. There was another color combo that was brass and black, which looked really cool, but this was a safer everyday bet.